Rob Zombie's Great American Nightmare has announced a second engagement for 2014. The ultimate Halloween horror event will invade the Chicago metropolitan area select nights from September 26 to November 1 at Odeum Expo in Villa Park, Illinois. Opening night will also feature a special one-night-only concert with Rob Zombie. "I am thrilled to be able to expand the Great American Nightmare to TWO new cities this year," said Zombie. "My only goal is to make it twice as sick as last year." The Great American Nightmare's second city will feature three attractions based on Zombie's own horror films: The Lords Of Salem In Total Black Out, The Haunted World Of El Superbeasto 3D and Haunt Of 1,000 Corpses. These attractions were first seen at the 2013 Great American Nightmare debut in Pomona, California and have been improved and enhanced based on visitor feedback. The fully immersive haunted house experience at Rob Zombie's Great American Nightmare will include the Bloody Boulevard with freak shows, musical entertainment, roaming characters, themed food and beverages, games and vendors each night. "After the tremendous success last year, we all felt we wanted to bring Great American Nightmare to as many people as possible," says Great American Nightmare producer Steve Kopelman. "Chicago is a haunted house hotbed with the Odeum Expo center being the go-to haunted house venue for the past two decades. We really feel the Midwest will welcome this event with open arms and this will be the ultimate Chicagoland Halloween event." As previously announced, Rob Zombie's Great American Nightmare will also make its debut at WestWorld Of Scottsdale in Arizona for select nights from September 19 to November 1. This engagement will feature the following three attractions — two that have never been seen before — based on Rob's horror films: The Lords Of Salem In Total Black Out, Captain Spaulding's Clown School In 3D and The Devil's Rejects. 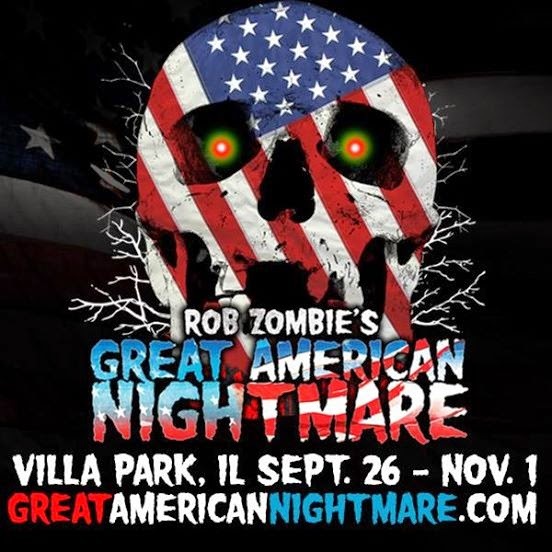 Tickets for Rob Zombie's Great American Nightmare go on sale Wednesday, July 30 at 10:00 a.m. CT at GreatAmericanNightmare.com, with prices starting at only $25 for September 27-November 1. Each ticket includes access to all haunted house attractions and the Bloody Boulevard activities. Tickets for opening night (September 26) include the Rob Zombie concert and will be available starting at only $45. A limited number of VIP packages will also be available for purchase at GreatAmericanNightmare.com. All VIP packages include a commemorative t-shirt and quicker access to the haunted attractions than general admission. Some packages also include a designated viewing area for the concert. The project captures Zombie in concert last summer in Houston (Aug 3) and Dallas (Aug 4) during the final two shows of the 2013 Rockstar Energy Drink Mayhem Festival.